Nintendo is no stranger to redesigns. The company's line of Game Boy portables is a perpetual work in progress, with each new generation adding a performance enhancement such as the LCD backlight and rechargeable battery or an aesthetic change--the SP's clamshell design or the downsized Game Boy Micro. The latest system to get the makeover treatment is the Nintendo DS, which originally hit stores back in November of 2004. Upside: The form factor of the original Nintendo DS wasn't the system's selling point. The bulky design and rounded edges of the handheld gave off a "child's toy" aura reminiscent of Nintendo's pre-Game Boy Game & Watch games. As its name suggests, the DS Lite is a much more compactly designed system, 39 percent smaller and 21 percent lighter than its predecessor. The rounded corners are more finely tapered, and the top and bottom sides are symmetrical, avoiding the "underbite" look of the original's oversize bottom half. Despite the smaller overall size, though, the trademark twin screens are the same size and now feature four backlight settings. All of the DS's other key features--Wi-Fi multiplayer, touch-screen control, and backward compatibility with Game Boy Advance (GBA) games--remain intact. Downside: Anyone hoping for a next-gen successor to the DS will be disappointed; this is strictly a cosmetic upgrade. The system's style upgrades are offset a bit by the fact that older GBA cartridges stick out a bit when placed in the DS Lite. That makes the unit slightly less portable when playing GBA games, since the original could essentially store GBA cartridges inside the unit. Nitpicks aside though, Nintendo fans are left with two big problems: when they can get one, and how much it will cost. 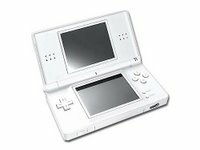 The DS Lite will be available in Japan as of March 2, 2006 for 26,800 yen (about US$143), but Nintendo has yet to set official launch dates and pricing for North America and Europe. Outlook: The Game Boy Micro didn't wow most handheld gaming fans because the system sacrificed screen size and backward compatibility with Game Boy and Game Boy Color games for the sake of style. By comparison, the Nintendo DS Lite looks to be on track to retain the performance--not to mention the screen size--of the original while improving the look and making it more pocketable. Of course, unlike the jump from the original Game Boy Advance to the GBA SP, there's not much in the way of improvement in the system's functionality, which will probably be reason enough for current DS owners to not fret about missing out on this update. Still, with demand for the original DS still high, the combination of an affordable price--say, no more than US$20 more than the original--and a continued stream of must-have DS titles, such as the forthcoming Tetris DS and Metroid Prime Hunters, makes us think that Nintendo could have another hit on its hands. I didn’t find the gap between screens not a big problem. I actually grew to like it as it really helped my aiming of eggs. Have you ever played Yoshi touch and Go (the escond half of the game), I always found the aiming confusing. By the way, I’m really enjoying the podcast. Its passing the time till the wii hits the UK.